Creating a Python app for Destiny – Part 2: Emailing Xurs inventory. In the previous tutorial, I showed how you could use Python to send a request using the Destiny API, to the Bungie servers and how to decrypt the JSON reply. If you haven’t read the previous tutorial, it’s right here. I’m going to gloss over how to write the HTML, as there are plenty of really good online resources for creating and styling websites, checkout codecademy if you’re interested in a free guide. Change our Get_Xur_inventory.py program so it writes the output as a HTML file. Have the program send this HTML, via Gmail, directly to our email. By writing our output as HTML we have a lot more control over the design and formatting of the email. 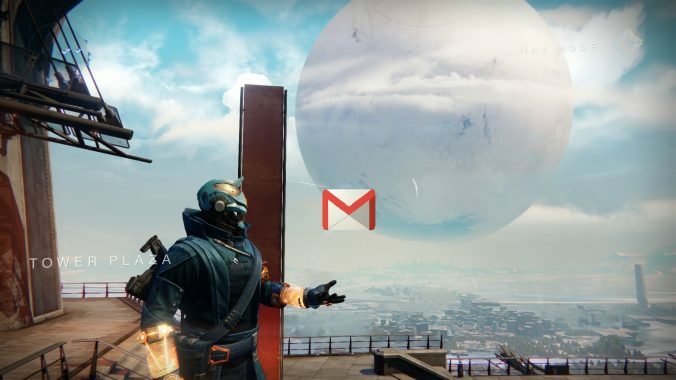 Using HTML will also allow us to directly embed the item pictures into out email, from the URL links provided in the JSON response from Xur. The hard part of the code is already done, with a few minor tweaks, we can have our program output Xurs inventory into a HTML formatted email. In order to create our output HTML, we are going to use a template HTML file to store as much of the generic HTML as possible, and change all of the print statements in our code to output HTML formatted data. We can then use our script to generate only the HTML needed to display the items from Xurs inventory, this will change every week so needs to be generated every time we run our script. The following code will open a file called “template.html” for reading, and save all of the contents into a string object called “my_html”, then close the file. Below is an example of how we’d like to format the HTML code, essentially we wrap it in a couple of <div>’s and display the image and text. my_html = my_html + "<div class=\"col-md-4\">\n"
my_html = my_html + "\t<div class=\"thumbnail\">\n"
my_html = my_html + "\t\t<a href=\"" + item_url + "\">\n"
my_html = my_html + "\t\t<img src=\"" + item_url + "\">\n"
my_html = my_html + "\t\t</a>\n"
my_html = my_html + "\t\t<h3>" + item_name + "</h3>\n"
my_html = my_html + "\t\t<p>" + item_type + "<p>\n"
my_html = my_html + "\t\t<p>" + item_description + "<p>\n"
my_html = my_html + "\t</div>\n"
my_html = my_html + "</div>\n"
We’ve wrapped each of the lines of HTML code in a write statement. We’ve already populated all of the item_url, item_name, item_type and item_description variables with our code. So here’s what each line is doing. In this example we are creating a <h3> heading, with the text from our “item_name”. “\t” creates a tab and “\n” moves to a new line. All of this text is concatenated into one string, which we add on to the end of the “my_html” string object. Now that we have created and populated <div>’s with each of Xurs items, we can add the code to close the HTML </body> and </html> tags. my_html = my_html + "\t\t</div> <!-- row -->\n"
my_html = my_html + "\t</div> <!-- container -->\n"
my_html = my_html + "</div> <!-- inventory-container -->\n"
my_html = my_html + "</body>\n"
my_html = my_html + "</html>\n"
The “my_html” string will store all of the HTML code used in the body of the email we send. Python comes installed with a number of really useful libraries, including the smtplib (Simple Mail Transfer Protocol library) and the MIMEMultipart and MIMEText (Multipurpose Internet Mail Extensions, allows text, images and other options) libraries. For this section I referenced two tutorials, here Nael Shaib shows how to make a basic email program, and here Darren Massena shows how to create a HTML formatted email and attach external pictures. Click here to allow less secure apps. Google will still reject access to your account, until you authorise it. Click here to authorise your app. This will authorise your app access to your Google account. Enable access for less secure apps. Alright, that’s enough talk – lets get to coding! Next we’ll set up our email address parameters, enter your details as follows. msgRoot.preamble = "This is a multipart message in MIME format." creates an email MIMEMultipart object, we then set the [‘To’], [‘From’] and [‘Subject’] parameters of the email on the following 3 lines. We’ve already populated the HTML into a string object called “my_html”. The following commands create an SMTP mail object, connect to the Gmail SMTP server on port 587. The next line actually logs into our Gmail account, we pass our Gmail address and password as parameters to this. As always, I’ll try to keep the GitHub repo up to date with any changes I make.